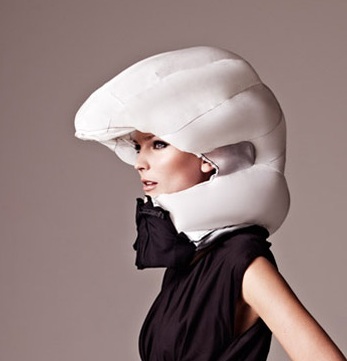 Writing about bicycle helmets always fills me with a slight sense of weariness. It’s just so tiring; all those tiresome arguments, fatuous ‘a helmet saved my life’ anecdotes and calls that unhelmeted bicycle riders should pay for their own care when they inevitably end up as brain damaged vegetables . The other problem with writing about it is that it seems it be something that people use to define me. I’m known as ‘that helmet guy’ (or perhaps ‘that helmet nutter’, depending on the viewpoint of the observer), when in reality helmets are quite a peripheral question in my wider interest in active transportation and urban planning. Still, a couple of helmet-related things have thrust themselves into my consciousness recently, such that I feel compelled to write about them. The other thing that caught my attention recently is the apparent softening towards helmet laws by some Australian cycling advocacy groups. Of course, the fact that our ‘advocacy’ groups in general strongly support helmet legislation is extraordinary, given the harm they do to cycling participation. Still, there have been a few hints that this attitude is changing – or is it? On the surface, perhaps it is. I have seen several examples recently of groups and individuals expressing a desire to have the helmet law changed or revoked. But. And there is a but. The but in this case is that it needs to be done in conjunction with a ‘package of measures’ to improve cycling conditions – things like lower speed limits, separated cycle lanes and so on. Apparently simply making it a matter of choice to wear a helmet cannot be countenanced until we have better cycling infrastructure. I suspect this attitude is borne of the fallacy that making people wear helmets actually improves safety at an aggregate level (it doesn’t, of course, but our cycling advocates are remarkably uninformed on these matters), so in some sort of compensatory logic helmets have to remain mandatory until such time cycling in Australia is safer than it is now. This is then often linked to another theme – that getting helmet laws changed is therefore not the most important thing on the cycling agenda, so we should all forget about the helmet thing and put our energies into lobbying for better road environments instead. Well, I’m sorry folks, but this just doesn’t wash. It doesn’t wash logically, and it doesn’t wash as a strategy. And here’s why. Let’s look at the idea that cycling infrastructure needs to be improved before freedom of choice is granted in terms of headwear. The implication is that ‘cycling is dangerous and helmets make it safer’. Presumably under this logic the law should be repealed at the point where the safety benefits delivered by improved infrastructure are equal to the safety benefits currently delivered by helmets. Leaving aside the point that there are no significant safety benefits to a helmet law (which is different to saying there are no benefits to wearing a helmet, although this distinction is lost on most), there are two major problems with this. Firstly, it implies that there is some kind of absolute standard of cycling safety, and that the conditions we have right now represent that minimum. But why? Who says the current conditions are that bad anyway? Riding a bike in Australia, whilst relatively more dangerous than riding in, say, Denmark, is still comparatively safe. It’s safer, for example, than playing netball. So on that point alone, the argument fails. However, it really falls apart when you consider the different profiles of locations and riders. A slow, utility cyclist who is lucky enough to live in an area with quiet roads and good bicycle facilities is at less risk than a fast, sports cyclist who lives in an area with no bicycle facilities and busy roads. Indeed, our utility cyclist one imagines already meets the criteria for ‘safer cycling’ envisioned by cycling advocates. So why does she still have to wear a helmet? Apparently because the sports cyclist is unfortunate enough to live in an area with poor bicycle facilities. So we have the bizarre notion that our safe utility cyclist will only be allowed to wear a sunhat when a cycle lane is built somewhere miles away from where she lives. If the ‘package-of-measurists’ were actually consistent and logical, they would be calling for a relaxation of the helmet law now for low-risk cyclists – perhaps akin to the Northern Territory law which does not require a helmet when riding on a path or bike lane. When you consider the NT has the highest cycling participation rate in Australia you’d think the advocates would be pushing at least for this. But they are not. Notwithstanding the lack of logic, thought, in terms of a strategy to get better cycling infrastructure it also falls down. This is because the one thing that makes it more likely that infrastructure will be built is getting more people cycling. Yes, it’s a chicken and egg thing, but there is no doubt that if there were more people cycling, cyclists would be more visible, have a larger voice and more political clout. So if getting more people riding bikes makes getting infrastructure built more likely, what can we do to get more people cycling? Well, lots of things – but the most significant one (aside from building bike lanes) is repealing helmet laws. And the harsh reality is that in the current political climate there is a much greater chance of getting helmet laws changed than there is of getting significant investment in bike facilities. A campaign to repeal the helmet law is probably one of only a few cycling issues that it would be possible to mobilise the non-cycling majority to support, given that it can be wrapped up in a number of more general memes that resonate with people. Pushing for increased spending on cycling infrastructure is an uphill task by comparison, as the majority of Australians, far from simply being apathetic on the issue, actively resent such expenditure. Thus the strategy of ‘build bike lanes and then we’ll talk about helmets’ is really back to front. Doing it the other way around actually offers the best opportunity to get more people on bikes, which then delivers additional leverage to get the infrastructure built. I’m sure that there are some readers of this who have taken umbrage that I seem to be implying that lobbying for better road facilities is pointless. Actually, nothing could be further from the truth. Indeed, if a genie came down tomorrow and offered me the choice of repealing helmet laws or waving a wand to create a network of high-quality bicycle lanes all over Australia (or, more parochially, simply over the bit of Sydney that I travel around) I’d go for the bike lanes every time. In that sense the ‘package-of-measurists’ are right in that infrastructure is more important that helmets. And I shall continue to write letters to all and sundry about bicycle facilities and issues, few of which are about helmets. However, the notion that even discussing bicycle helmet reform is not important, and that there are other things to be done first is equally flawed. The reality is that we need to campaign on all fronts for improved conditions for cyclists in Australia. And pushing for helmet law reform is an important aspect of that campaign that should be tackled now. Well, dear readers, I must apologies for how late this review is! Notwithstanding the ‘sweet wishes’ range having been launched over a year ago, I never got around to publishing a review of the last variety of the trio – ‘Honeycomb’. I say ‘publishing’, as I actually wrote the review over a year ago, but somehow it’s been languishing in my ‘drafts’ folder for months and months. Well, here it is for your reading pleasure! The ‘Honeycomb’ variety is the final instalment in the ‘Sweet wishes’ range, which also includes the rather awful Turkish Delight and the rather good Choc Caramel. 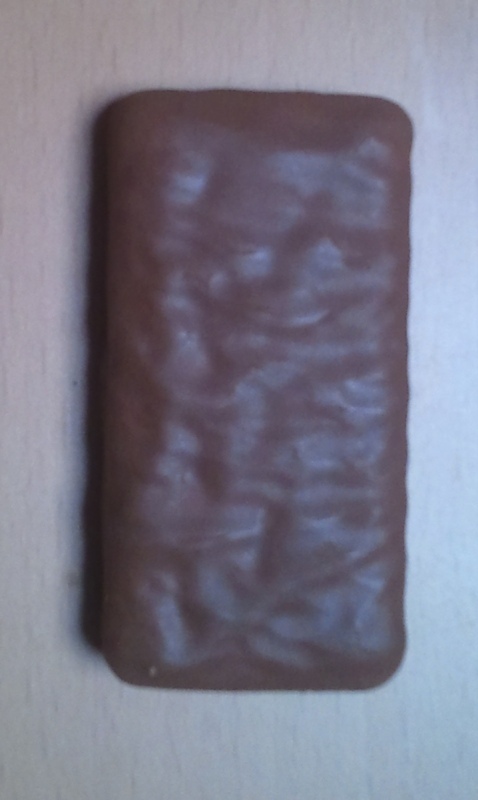 Is the Honeycomb Tim Tam going to pull the range up to an honourable two out of three, or cause it to sink ignominiously into ordinaryness? It’s all classic Tim Tim stuff to look at, although I do note that these biscuits actually contain powdered honeycomb. The cream filling is a pale orange colour. There isn’t really much of a distinctive taste; just a general sweetness. Overall perhaps a hint of hokey-pokey flavour, but not really honey. That said, they are quite pleasant, just a little anonymous. Not a classic variety, but not at all offensive. I’m going to give these a six out of ten. I recently attended a gathering of folks from the sydneycyclist.com web forum. As you might expect, we met up in a pub, and there was much geeky talk about bikes, endless surprise at meeting the real manifestation of various online personae (goodness, MichaelO really is tall, isn’t he!?) and beer. Oh, and the Tour de France was on the big screen. All lots of fun, in a nerdy kind of way. And there were lucky door prizes. And I got lucky, and won a jersey from Australian cycling wear manufacture Babici. Very exciting, since I never usually win anything I actually want (although I do have a knack for winning things I don’t; over the years I’ve bagged such items as a strange tapestry, a miniature slow cooker and a dozen lavender scented candles). 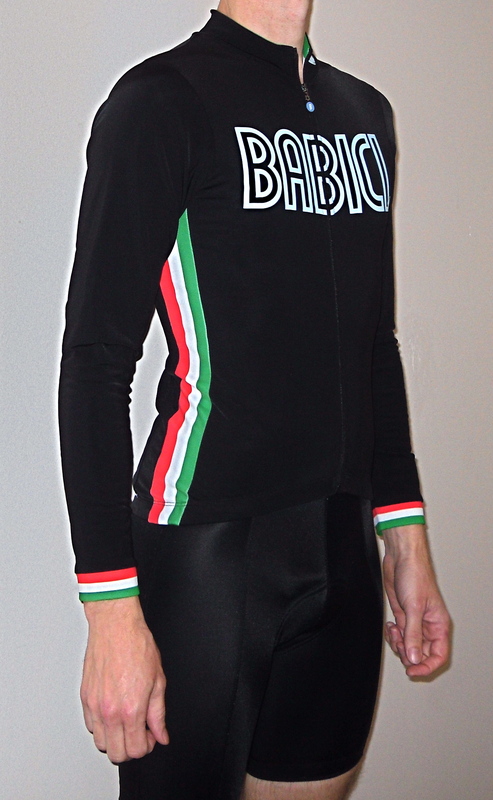 I didn’t really know very much about Babici, but the prize was basically any jersey from their range. So I went online and had a look. Goodness! These things cost over $150! What cycling clothes I own are all own-name brands bought from discount retailers in the sale. This was to be my first experience of ‘high end’ cycling clothes. I chose the ‘Italo’ version, and fancied once wearing it I could hang out nonchalantly in coffee shops in the manner of the model in the catalogue. After making my selection it arrived a few days later, together with a very nice hand-written note from the Babici guys, which was a lovely touch. It also came in its own special cloth bag. Wow. I don’t think I’ve ever had an item of clothing before that came in anything other than a plastic bag. A few days later, I wore it on my ride to work, on a morning where I had time to take the long way round, in order to test it properly. It was a lovely day; quite cool but sunny. Perfect weather for a winter jersey. Although, saying that, I actually only own one other long sleeved jersey, and don’t wear it much as I inevitably end up getting too hot – even in cold weather. So normally I just use arm warmers and end up taking them off after fifteen minutes. Was I going to get to hot in my new jersey too? Well, there obviously is something in this expensive clothing lark, as I didn’t. The weight and breatheability of the fabric was perfect, and I was very comfortable for my whole ride – not too cold at the start, and not to hot when I got going. Actually, I have to say my new jersey is very comfortable to wear. Much more comfortable than anything else in my rather daggy collection. Perhaps I have been practising false economy over the years, and rather having a bulging drawer of tatty jerseys costing $50 each, I should just invest in fewer good ones.